A majority of Americans say 2018 will be a better year than 2017, a shift from a year ago when public expectations were far less positive. The change has been driven almost entirely by Democrats, who are more likely than Republicans to cite this fall’s midterm elections as a reason for optimism. And significantly more Democrats than Republicans say they are “looking forward” to the elections. Donald Trump begins the year with a job approval rating of 37%, which is little different from his rating shortly after his inauguration last year (39%). Large majorities continue to view Trump negatively on such traits as being trustworthy, well-informed, empathetic and even-tempered. As was the case last year, one of Trump’s stronger traits is his ability to get things done; 50% say he is able to do this. But on what had been his most positive characteristic a year ago – keeping his promises – Trump is now viewed more critically. Just 39% say Trump keeps his promises, down from 60% last February. 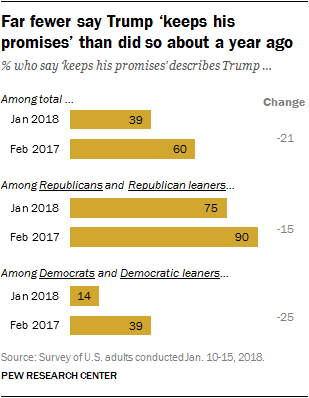 The decline has come among members of both parties, though Republicans continue to be much more likely than Democrats to say Trump keeps his promises. The new national survey by Pew Research Center, conducted Jan. 10-15 among 1,503 adults, finds that 61% of the public thinks this year will be better than last year; a year ago, 49% said 2017 would be better than 2016. Optimism among Republicans and Republican-leaning independents remains very high (88% expect this year will be better than last) and has increased substantially among Democrats and Democratic leaners (from just 24% last year to 42% today). 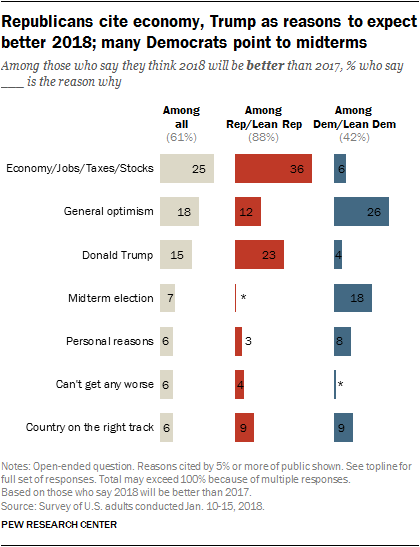 Republicans and Democrats who see a better year ahead differ markedly in their reasons for saying this: 36% of Republicans cite the economy, jobs or the stock market for why 2018 will be better, while 23% cite Trump or his policies. Among Democrats who think this year will be better, 26% say they are generally optimistic, while 18% mention the midterm elections. Fewer than 1% of Republicans point to the midterms as why they think 2018 will be better than last year. Among the 29% of Americans (mostly Democrats) who say 2018 will be worse than 2017, Trump figures prominently among the reasons for their negative expectations. Roughly half (46%) point to Trump or his policies as why they think this year will be worse than last year; no other response comes close (11% cite Republican policies). At the start of the election year, Democratic registered voters, are more likely than Republican voters to say they are looking forward to the midterms – a shift from the past two midterm elections. Currently, 69% of Democratic registered voters say they are looking forward to the midterms, compared with 58% of Republicans. At this point in 2014, Republicans were 12-percentage points more likely than Democrats to say they were anticipating the election and the gap was comparable early in 2010 (15 points). 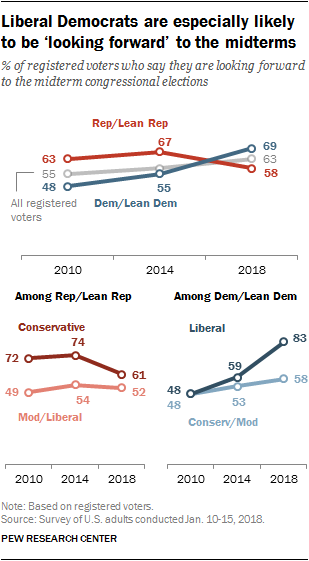 Liberal Democrats, in particular, are looking forward to the midterms: 83% say that today, compared with 59% in 2014 and 48% in 2010. 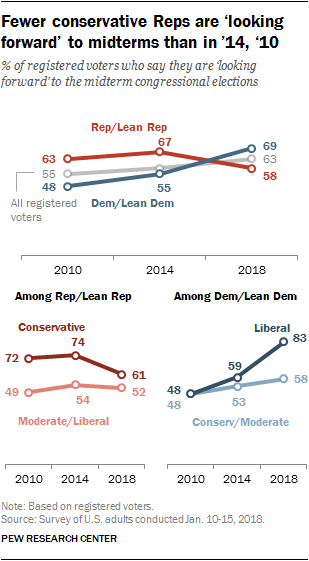 By contrast, 61% of conservative Republicans say they are looking forward to the midterms, lower than in 2014 (74%) or 2010 (72%). As other national surveys have found, Democrats have an early advantage in voting preferences for the midterm elections: 53%of registered voters say if the election were held now, they would vote for the Democrat in their House district or lean toward the Democrat, while 39% favor the Republican or lean Republican. 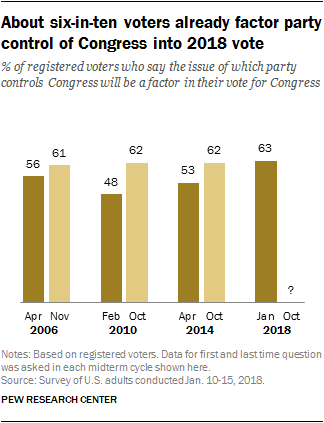 With the election about 10 months away, a majority of registered voters (63%) say the issue of which party controls Congress will be a factor in their vote this year. This is a greater percentage than said this at early points in the 2014, 2010 and 2006 midterm cycles. The share saying partisan control of Congress will matter in their vote is now about as high as it was in the closing weeks of those elections. Majorities of both Democratic (68%) and Republican voters (62%) say the issue of which party controls Congress will be a factor in their vote in the midterms. 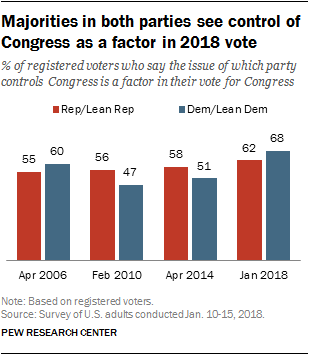 Democrats, in particular, are more likely to view partisan control as important than at roughly this point or later in the past three midterm elections. Little confidence in Trump on issues. As in the past, Trump does not draw a great deal of confidence for his ability to handle many major issues. About half (46%) say they are very or somewhat confident that Trump will make good decisions on economic policy (51% are not too confident or not at all confident). 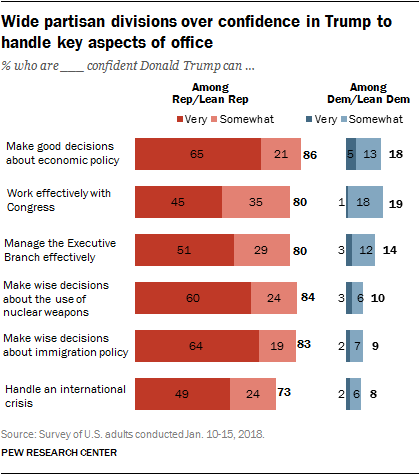 About as many Americans (44%) say they are at least somewhat confident in Trump to work effectively with Congress, while fewer express confidence in Trump on immigration policy (38%) and in his ability to handle an international crisis (35%). Fewer Republicans say Trump is obligated to release his tax returns. 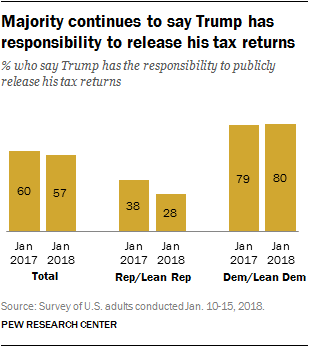 Nearly six-in-ten Americans (57%) say Trump has a responsibility to publicly release his tax returns, which is little changed from a year ago (60%). However, fewer Republicans say Trump needs to release his returns than did so last year (28% now, 38% then). Democrats continue to overwhelmingly say Trump has an obligation to release his taxes (80% say this). Anti-incumbent sentiment again high. In the past two midterm elections, anti-incumbent sentiment was at a historical high. That remains the case this year: Just 25% of voters say they would like to see most representatives re-elected and only about half (48%) say they want their own representative to be re-elected. 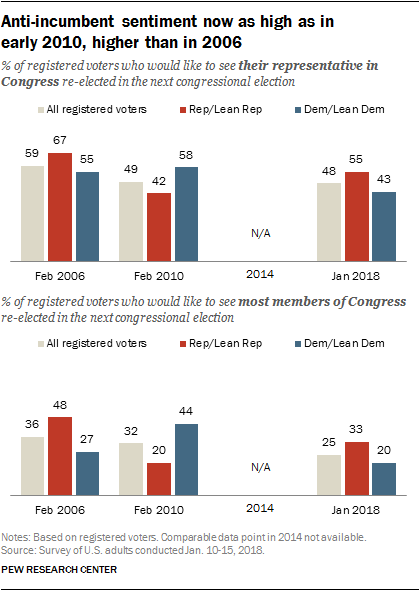 Anti-incumbent sentiment is more widespread among Democrats than Republicans. Fewer than half of Democrats say they want their own representative returned to Congress, compared with 55% of Republicans. Education a major factor in midterm voting intentions, especially among whites. Deep educational differences among white voters, which increased considerably in the 2016 election, are already stark in early voting intentions for Congress. Among white voters with a postgraduate degree, 65% favor the Democrat in their House district or lean Democratic; among white voters with a four-year degree, 53% say the same. White voters with some college experience but no degree favor the Republican by a 48%-42% margin. And whites with no college experience favor the Republican by more than two-to-one (65% to 28%). The public’s evaluation of the way Trump is handling his job as president is now roughly on par with views at the outset of his presidency, reflecting a modest rise in approval over the last month. Today, 37% of Americans approve of the job that Trump is doing, while 56% disapprove; last month, 32% approved while 63% disapproved. The demographic differences in views of Trump’s job performance are also little changed over the course of the year. Men continue to be more likely to approve of the president’s job performance than women (42% versus 32%). And while evaluations of Trump’s job performance are divided among whites (47% approve, 46% disapprove), wide majorities of blacks (76%) and Hispanics (78%) disapprove. Those with postgraduate degrees are significantly less likely than others to approve of Trump’s job performance. Just 23% say they do compared to 31% of those with bachelor’s degrees, and 40% of those with less education. There also are wide divides by religious tradition. White evangelical Protestants continue to be the religious group with the strongest approval of Trump’s job with 72% approving. White mainline Protestants are divided (48% approve, 44% disapprove). Six-in-ten Catholics (60%) disapprove of the job Trump is doing in office, and Black Protestants and the religiously unaffiliated overwhelmingly disapprove of how he is handling his job (76% and 73%, respectively). 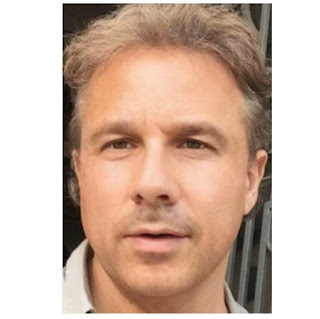 During the period the survey was being conducted it was widely reported that Trump made derogatory remarks about African countries and Haiti during a bipartisan meeting in the Oval Office on Jan. 11. Overall, Trump’s approval was slightly higher in the days before widespread coverage of his remarks (40% Jan. 10-11) than after his comments sparked controversy (34% Jan. 12-15). The dip in Trump approval was concentrated among Republicans and those who lean toward the Republican Party. Prior to the reports of Trump’s comments, 84% of Republicans said they approved of the job he was doing. After the comments were widely reported, that figure dropped to 76%. There was no significant difference in evaluations of Trump’s job performance over the period of the survey among Democrats and those who lean toward the Democratic Party. How will Trump’s presidency be viewed in the long run? 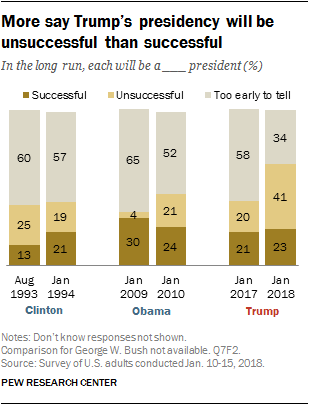 As Donald Trump’s presidency approaches the one-year mark, 41% say Trump will be an unsuccessful president in the long run, while 23% say he will be successful and 34% say that it is too early to tell. The share of the public who say Trump’s presidency will be successful over the long term is little changed from shortly before he took the oath of office last January. But the share who now say Trump will be unsuccessful has increased 21 percentage points (from 20% to 41%) since then, while the share who say it is too early to say has dropped from 58% to 34%. Republicans and Democrats have very different views of whether Trump’s administration will be a success in the long run. And in both parties, smaller shares reserve judgement than did so for Obama and Clinton, resulting in even more polarized early assessments of Trump’s presidency than for his predecessors. About half of Republicans and Republican-leaning independents (55%) say Trump will be a successful president; just 7% say he will be an unsuccessful president and 37% say it is too early to tell. Among Democrats and Democratic leaners, two-thirds (67%) say he will be unsuccessful, 3% say successful and 29% say it is too early to say. 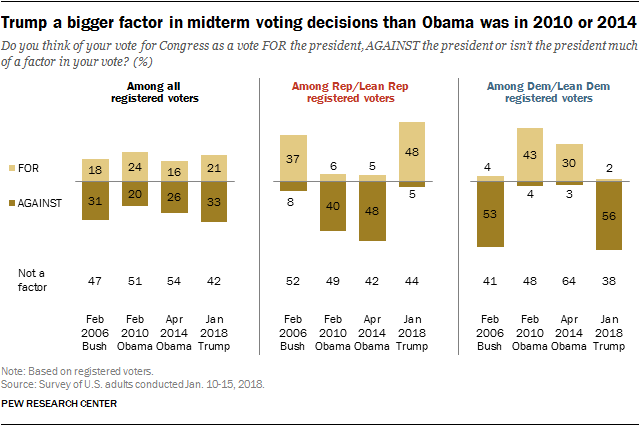 Republicans and Republican leaners are more likely to say Trump will be a successful president than Democrats and Democratic leaners were about Obama and Clinton at similar points in their presidencies. About half of Republicans (55%) now say Trump will be a successful president in the long run; 40% of Democrats said this of Obama in 2010 and 35% of Clinton in 1994. Currently, just 37% of Republicans say it is too early to tell how the Trump presidency will unfold; majorities of Democrats said this of Obama in January 2010 (56%) and Clinton in 1994 (58%). For all three presidents, fewer than one-in-ten of those who affiliate with or lean to the president’s party say the president will be unsuccessful. Conversely, while two-thirds of Democrats (67%) say Trump will be unsuccessful in the long run, that compares with 43% of Republicans who said this of Obama in January 2010 and 34% of Clinton in 1994. 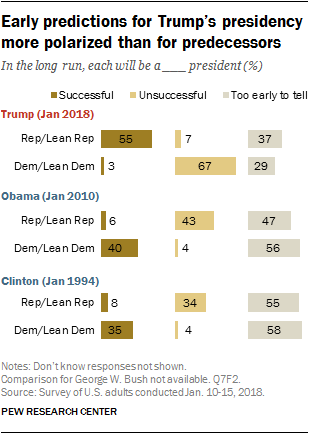 While few Republicans expected Clinton or Obama’s presidencies to be successful, roughly half said it was too early to tell at this point, compared with just 29% of Democrats who say the same today of Trump. The public holds generally negative assessments of Trump across a range of personal traits and characteristics, and there has been little change in public perceptions of most of these traits since February 2017, shortly after he took office. One exception is in views of whether Trump keeps his promises: Today, more say Trump does not keep his promises (54%) than say he does (39%). Opinion on this measure is much more negative than it was in February 2017. At that time, far more described Trump as someone who keeps his promises (60%) than as someone who does not (31%). Perceptions of Trump’s other personal traits have changed less over the past year. Half describe Trump as able to get things done, while 46% say this does not describe him. On all other traits included in the survey, more view him negatively than positively. Nearly seven-in-ten (68%) say that Trump is not even-tempered (just 25% say that he is); 64% say that he is not a good communicator (31% say he is). Most also say they think of Trump as someone who “does not care about people like me” (62%), is not well-informed (61%) and is not trustworthy (59%). By 54% to 44%, more say Trump is not a strong leader than say he is. Among members of both parties, declining shares say Trump “keeps his promises.” Three-quarters of Republicans and Republican leaners (75%) describe Trump as someone who keeps his promises, down 15 points from the 90% who said this in the first weeks of his presidency. Last February, 39% of Democrats and Democratic leaners described Trump as someone who keeps his promises – making it the trait he did best on among Democrats. Today, the share of Democrats who say Trump keeps his promises has fallen 25 percentage points to 14%. Across most dimensions, large shares of Republicans and Republican leaners describe Trump positively. For instance, 87% think of him as able to get things done and 85% call him a strong leader. About three-quarters (76%) describe Trump as someone who “cares about people like me,” while a similar share (73%) say he is well-informed. On both of these measures, GOP views are 12 percentage points lower than they were last February (when 84% and 81% said this, respectively). A smaller majority of Republicans describe Trump as a good communicator (59% say this today, down from 67% last year). Trump gets his lowest marks among Republicans when it comes to his temperament: 49% say they think of him as even-tempered, while 44% say they do not think of him this way; this is nearly identical to GOP views on this trait at the beginning of Trump’s presidency. Views of Trump’s traits among Democrats and Democratic leaners are overwhelmingly negative. 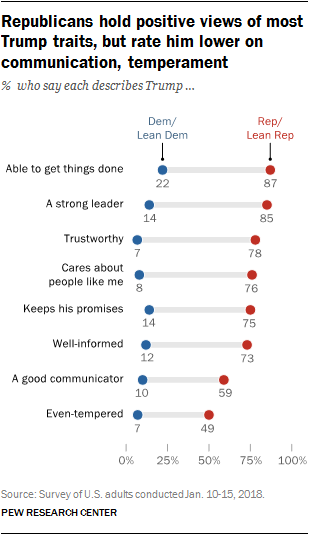 Just 22% of Democrats describe Trump as someone who is able to get things done – yet this is the most positive rating he receives from Democrats on any one trait. On all other qualities, no more than about one-in-ten Democrats describe Trump positively. At the close of his first year in office, impressions of Trump on six personal traits lag behind those of his predecessor, Barack Obama, at a similar point. Yet the size of the differences varies across characteristics. By far the widest gap in views of Trump and Obama is on communication. Just 31% describe Trump as a good communicator; this is among his lowest ratings. By contrast, 83% described Obama as a good communicator in January 2010; that was his most positive characteristic. On the other hand, the differences are much narrower in perceptions of each president’s ability to get things done. In January 2010, 57% of the public said Obama was “able to get things done,” compared with 50% who say this of Trump today. This seven percentage point gap is smaller than for other traits included in both surveys. The public expresses mixed or low confidence in Donald Trump to handle a range of issues and aspects of the presidency. Roughly half (46%) say they are very (29%) or somewhat (17%) confident that Donald Trump can make good decisions about economic policy, while about as many (51%) say they are not too (14%) or not at all (37%) confident in him in this area. Public views tilt more negative when it comes to Trump’s handling of other aspects of the presidency. Overall, 54% say they are not too or not at all confident that Trump can work effectively with Congress, compared with fewer (44%) who are very or somewhat confident in Trump’s ability to do this. Similarly, more express little or no confidence in Trump to manage the executive branch effectively (56%) than say they are very or somewhat confident that he can do this (41%). Doubts about Trump extend beyond his ability to manage Washington: Nearly six-in-ten express little or no confidence in Trump to make wise decisions about immigration policy (59%) or the use of nuclear weapons (58%). 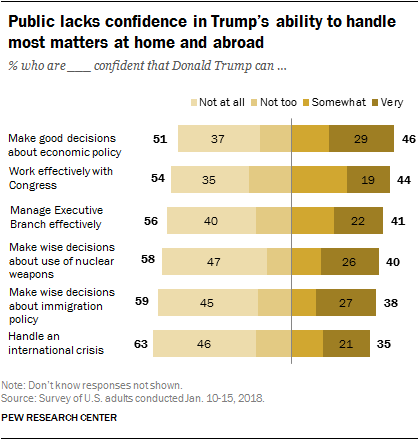 When it comes to his ability to handle an international crisis, 63% say they have not too much or no confidence at all in Trump, compared with 35% who say they are very or somewhat confident in him. Republicans and Republican leaners express far more confidence in Trump than Democrats and Democratic leaners. No more than about two-in-ten Democrats express at least some confidence in Trump to handle any of these areas, while wide majorities of Republicans (seven-in-ten or more) express confidence in Trump’s abilities in each of these domains. These partisan differences are particularly pronounced over confidence in Trump’s ability to make wise decisions about immigration policy and nuclear weapons. Among Republicans, 84% say they are very (60%) or somewhat (24%) confident in Trump’s ability to make wise decisions about the use of nuclear weapons. By contrast, just 10% of Democrats express at least some confidence, while 90% say they are either not too (16%) or not at all (74%) confident in Trump’s ability to make wise decisions about nuclear weapons. A similar gap is seen in views about immigration policy. Fully 83% of Republicans are at least somewhat confident Donald Trump can make wise decisions about immigration policy, including 64% who say they are very confident. By contrast, 72% of Democrats express no confidence at all in Trump’s decision-making on immigration policy and an additional 17% say they have little confidence in him on this issue (just 9% say they are very or somewhat confident in Trump on immigration). The confidence gap among partisans is somewhat more modest – though still wide – in assessments of Trump’s ability to effectively work with Congress. Roughly one-in-five Democrats (19%) and 80% of Republicans are at least somewhat confident in Trump’s ability to work well with Congress. Republicans are more likely to say they are very confident in Trump’s ability to work effectively with the House and Senate than they were last fall. In October, 31% said they were very confident in Trump on this issue, compared with 45% who say this in the current survey. A majority of Americans (57%) say Donald Trump has a responsibility to publicly release his tax returns; 37% say he does not have a responsibility to do this. Overall, these views are little changed from a year ago. Democrats remain far more likely to say this than Republicans: 80% of Democrats and Democratic leaners say Trump has this responsibility; just 28% of Republicans and Republican leaners say the same. While Democratic views on this question are similar to last year, there has been a 10-percentage point drop in the share of Republicans who say Trump has a responsibility to release his tax returns publicly since January 2017. The public remains skeptical that Trump keeps his own business interests separate from the decisions he makes as president: About four-in-ten (41%) say they are very (23%) or somewhat (18%) confident Trump does this, while a 57% majority is either not at all (43%) or not too (14%) confident. These views are little different from February 2017. 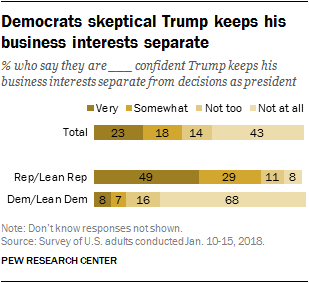 Republicans and Democrats continue to have very different views of whether Trump separates his business interests from his decisions as president. Among Republicans and Republican leaners, 49% are very confident he keeps his business interests separate while 29% are somewhat confident. In contrast, an overwhelming majority of Democrats (84%) are either not at all (68%) or not too (16%) confident he keeps his business interests separate from his presidential decision making. Nearly nine-in-ten Americans (88%) say they have heard at least a little about the investigation into Russian involvement in the 2016 election, including 55% who have heard a lot. Just 11% say they have heard nothing at all. While majorities across all demographic groups have heard about the investigation, older people and those with more education are more likely than others to say they have heard a lot. For example, while 69% of those ages 65 and older report hearing or reading a lot about the Russia investigation; that compares with 53% of those 30-49 and just 36% of those who are 18-29. About seven-in-ten of those with a college degree or more education (72%) say they have heard a lot about the investigation. By comparison, 59% of those with some college experience and just 39% of those with a high school degree or less say the same. Republicans and Democrats are about equally likely to say they have heard a lot about the investigation. The public’s confidence that special counsel Robert Mueller will conduct a fair investigation into Russian involvement in the 2016 election is largely unchanged from last month. Most say they are at least somewhat confident (55%) Mueller will conduct a fair investigation while 37% are not too or not at all confident the investigation will be fair. The partisan divide in confidence in Mueller is also little different than it was in December. Among Republicans and Republican-leaning independents, 45% say they are very or somewhat confident he will conduct a fair investigation, while 48% express little or no confidence. By contrast, about two-thirds of Democrats and Democratic-leaning independents (65%) are at least somewhat confident in Mueller to conduct a fair inquiry; just 29% say they are not too or not at all confident. Americans who report having heard “a lot” about the investigation into Russian involvement in the 2016 election are more likely than those who have heard less to express confidence in Muller to conduct a fair investigation. About six-in-ten (62%) who have heard a lot express at least some confidence, including 38% who say they are very confident in Muller. By comparison, 47% of those who have heard less about the investigation express at least some confidence, including just 13% who say they are very confident. There is little difference between these groups in the share who express low levels of confidence (those who have heard less about the investigation are less likely to offer an opinion than others). The partisan gap in confidence that Mueller’s investigation will be fair is deepest among those who have heard a lot about the Russia investigation. 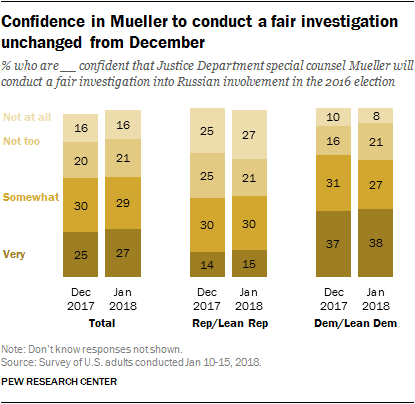 Among Republicans and Republican leaners who have heard a lot, 35% say they are not at all confident Mueller will be fair; just 14% of Republicans who have heard a little or nothing say the same. Conversely, while 57% of Democrats and Democratic leaners who have read or heard a lot say they are very confident in Mueller compared with 15% of Democrats who report hearing a little or nothing about it. The public’s expectations for 2018 are much more positive than they were for 2017. But as been the case for more than a decade, the outlook for the year ahead is divided along partisan lines. Overall, 61% of the public thinks 2018 will be a better year than 2017; last January, 49% said 2017 would be a better year than 2016. About twice as many Republicans and Republican-leaning independents as Democrats and Democratic leaners expect this year to be better than last year (88% vs. 42%). Still, the partisan gap was even wider last year, following the 2016 election; 83% of Republicans expected a better year in 2017, compared with just 24%of Democrats. Among the 61% majority of Americans who expect a better year in 2018, 25% cite the economy and job situation as a reason they feel this way, while 18% describe a general sense of optimism. Many also mention political considerations: 15% say Trump is a reason they expect a better year in 2018, and 7% mention the upcoming midterm elections. Republicans and Democrats who expect a better year ahead offer very different reasons for their views. Among Republicans and Republican leaners, 36% cite the economy and jobs, while 23% say Trump is a reason they think 2018 will be better than 2017. Few Democrats and Democratic leaners say the economy (6%) or Trump (4%) are reasons they are optimistic about the year ahead. Instead, 26% of Democrats describe general optimism about the new year, and 18% say they think 2018 will be better than 2017 because of the midterm elections this fall. Fewer than 1% of Republicans cite the midterms as a reason they expect a better year in 2018. About three-in-ten overall (29%) take a dim view of the new year, expecting it to be worse than 2017. Overall, 44% of Democrats expect 2018 to be worse than 2017; by contrast, very few Republicans say this (6%). Among those who expect a worse year in 2018, an overwhelmingly Democratic group, Trump is the most frequently cited reason they feel this way. 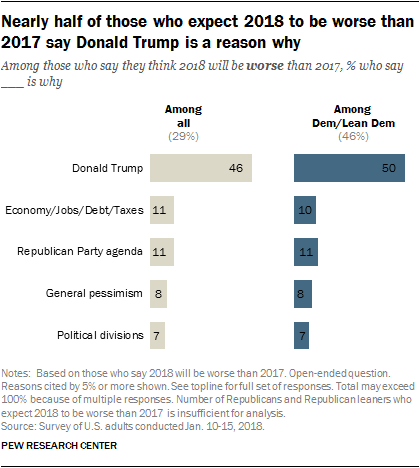 Almost half (46%) of those who expect a worse year in 2018 say Trump is a reason for this view. Far smaller shares cite other factors, such as the economy, debt and taxes (11%) or the Republican Party’s agenda (also 11%) as to why they think 2018 will be worse than 2017. Should Trump and Democratic leadership work together in 2018? Two-thirds of the public (66%) say Donald Trump should work with Democratic leaders to accomplish things this year, even if it means disappointing some groups of Republican supporters; 22% say he should stand up to Democrats on issues that are important to Republican supporters, even if it means less gets done in Washington. About half of Americans (53%) say Democratic leaders should work with Trump, even if it means disappointing Democratic supporters, while 39% say they should stand up to Trump on issues important to Democrats, even if it means less gets done in Washington. In November 2016, the pattern of opinion was similar among those who had voted in the presidential election. Republicans and Republican leaners are roughly split over whether Trump should work with or stand up to Democrats this year. About half (49%) say he should work with Democrats to get things done while 40% say he should stand up to Democrats on issues important to Republicans. About eight-in-ten Democrats and Democratic leaners (81%) say he should work with Democrats. 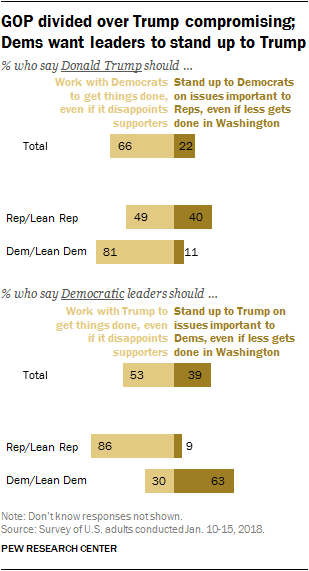 About twice as many Democrats say that Democratic leaders in Washington should stand up to Trump on issues important to Democrats, than say they should work with Trump to get things done (63% vs. 30%). An overwhelming majority of Republicans (86%) say Democratic leaders should work with Trump to get things done. The combined landline and cell phone sample are weighted using an iterative technique that matches gender, age, education, race, Hispanic origin and nativity and region to parameters from the 2016 Census Bureau’s American Community Survey one-year estimates and population density to parameters from the Decennial Census. 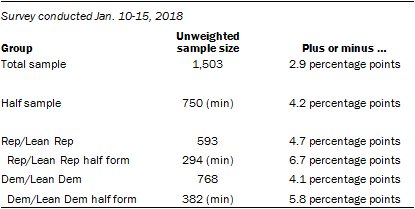 The sample also is weighted to match current patterns of telephone status (landline only, cell phone only, or both landline and cell phone), based on extrapolations from the 2016 National Health Interview Survey. The weighting procedure also accounts for the fact that respondents with both landline and cell phones have a greater probability of being included in the combined sample and adjusts for household size among respondents with a landline phone. The margins of error reported and statistical tests of significance are adjusted to account for the survey’s design effect, a measure of how much efficiency is lost from the weighting procedures.